Request an information kit now and learn more about the future of investing. The indices and NAVs provided above are merely estimates and are updated weekly; Reported returns are net of fees and expenses, with the exception of subscription, redemption fees and taxes (if any). Updates occur on a weekly basis. The information contained in this website does not constitute legal or fiscal advice nor does it provide specific investment advice. The information provided on this website is for personal, non-commercial use. The distribution of the provided information is not permitted. This website has been prepared without taking into account anyone’s objectives, financial situation or needs so before acting on it consider its appropriateness to your circumstances. Prospective qualified investors should take appropriate investment advice and inform themselves as to the legal requirements, exchange control regulations and taxes in their countries of citizenship, residence or domicile. This website serves solely as general information about certain investment providers and investments and may not be construed as investment advice. The information contained herein does not constitute a solicitation or offer to invest in any financial products. No investment products are offered or sold in any jurisdiction, or in any manner, in which an investment would be contrary to the applicable securities laws or any other local laws or regulations. Therefore certain products of the Superfund Group may not be available in your jurisdiction. Applications from persons who do not meet applicable eligibility or suitability requirements will be refused without exception. The financial products mentioned in this website are only admitted for (public) sale or may only be advertised (publicly) in certain jurisdictions, where they are subject to strict regulations. As of the date of publication, certain Superfund products are authorized or permitted to be sold publicly to persons in the United States, Austria, Germany, Poland, Luxembourg, the Netherlands and Japan, subject to various conditions and limitations. Such products are not authorized for sale to the general public in any other jurisdictions. Subscriptions from persons or entities in such other jurisdictions will not be accepted unless such persons or entities fall under a specific exemption in accordance with applicable laws in those jurisdictions. No invitation may be made to the public in the Cayman Islands to subscribe for shares in the funds referred to herein. None of the financial products mentioned in the international (Other areas) websites are available to US investors, which websites are not intended for viewing by US investors. Only the products and information on the USA website are available to and intended to be viewed by US investors. In the United States, Superfund Green, L.P. and Superfund Gold, L.P. are registered with the Securities and Exchange Commission and are available only to certain US investors that meet suitability requirements. No other products managed by members of the Superfund group of affiliated investment companies (the “Superfund Group”) are available to US investors. Funds managed by members of the Superfund Group are not available for subscription or purchase by persons resident in Hong Kong or Singapore except under prescribed exemptions under the laws of those jurisdictions. In Hong Kong, funds managed by members of the Superfund Group are not authorized by the Securities and Futures Commission. Only persons who qualify as professional investors under the Securities and Futures Ordinance are eligible to apply for shares of such funds. In Singapore, the sub-funds of Superfund SICAV have been recognized by the Monetary Authority of Singapore as restricted schemes. Accordingly, institutional investors and relevant persons (as defined under the laws of Singapore) are eligible to apply for shares of such sub-funds. Otherwise, funds managed by a member of the Superfund Group are not recognized by the Monetary Authority of Singapore and only persons who qualify as institutional investors (as defined under the laws of Singapore) are eligible to apply for shares of these funds. The information/material in this website is directed at only persons outside Singapore and may be acted upon only by persons outside Singapore. In Japan, only qualified institutional investors (as defined under the laws of Japan) are eligible to apply for shares of funds managed by members of the Superfund Group without solicitation in Japan pursuant to an exemption and subject to resale restrictions. If any solicitation is conducted within Japan, a filing with the Financial Services Authority (FSA) is required before solicitation and other requirements for a private placement to qualified individual investors must be satisfied. Absent the same, no persons other than qualified institutional investors are eligible to apply for shares of funds managed by members of the Superfund Group which are not registered with the Director of Kanto Local Finance Bureau of the Ministry of Finance. Certain funds managed by members of the Superfund Group are currently not licensed for public offering and distribution in Switzerland and are therefore, subject to certain specific exemptions, not available for purchase by persons domiciled or resident in Switzerland. This website does not represent a prospectus or an offering memorandum under the laws of any jurisdiction. Please refer to the applicable prospectus or offering documents for further details of the risks, fees, and expenses involved in connection with an investment in any particular Superfund fund. The performance results shown on this website are reported net of fees and expenses, with the exception of subscription and redemption fees (if any). The information contained herein has been compiled from sources deemed reliable and is accurate to the best of the publisher’s knowledge. However, its complete accuracy, completeness and reliability cannot be guaranteed. Estimations are based on opinions at the time of analysis. Changes of these estimations are not required to be published. Any liability for possible mistakes is hereby expressly disclaimed and excluded. Past performance of the financial products contained in this website, especially performance figures of Superfund Q-AG (closed fund), Superfund GCT USD/EUR (closed funds) and Superfund Cayman Master Class A (closed fund), are not indicative of future results for these or any other products. They exclusively serve as a historical presentation of the performance of their respective trading managers and of certain members of the Superfund Group. Every capital investment contains risks. The value of an investment may fall as well as rise. No subscriptions or follow-up subscriptions from existing investors are possible or will be accepted in closed funds. Superfund funds may be subject to certain conflicts of interests. All financial products managed by members of the Superfund Group are speculative investments and a total loss of the principal invested cannot be excluded. Fluctuations in the USD/EUR exchange rate may substantially decrease the net asset value in products traded in US Dollars. Important notice to Superfund Green products: There is a substantial risk of loss in trading futures and options. Drawdowns may occur due to market conditions and may range approximately from 20% to 30% from the respective all-time-high of Green strategy A, from 30% to 40% of the respective all–time high of Green strategy B and from 40% to 50% of the respective all–time high of Green strategy C. Decreases in value exceeding these figures are also possible at anytime, and the possibility of a complete loss of the principal invested cannot be excluded. Important Notice to Superfund Red, Superfund Red Gold and Superfund Red Silver: There is a substantial risk of loss in trading futures and options. Drawdowns may occur regularly due to market conditions and may range approximately from 30% to 50% from the respective all-time-high. Decreases in value exceeding these figures are also possible at anytime, and the possibility of a complete loss of the principal invested cannot be excluded. Superfund Red USD, Superfund Red Gold and Superfund Red Silver are traded in USD. Fluctuations in the USD/EUR exchange rate may substantially decrease the net asset value. Superfund Blue SPC Class A (EUR) and Class A (Gold) may not involve the direct purchase and sale of equity securities, but rather may trade synthetically through total return swaps on such securities utilizing a leverage of up to four times of the funds assets. Swap investments through a prime broker bear the issuer risk of the respective broker. Drawdowns may occur regularly due to market conditions and may range approximately from 10% to 15% from the respective all-time-high. Decreases in value exceeding these figures are also possible at anytime, and the possibility of a complete loss of the principal invested cannot be excluded. Special Risk Considerations for Investments in Superfund Green/Blue Gold: In addition to the trading results of the respective Superfund trading strategy, the value of shares of Superfund Green/Blue Gold will be directly affected by movements in the U.S. dollar price of gold. DEPRECIATION OF THE GOLD PRICE WILL DIRECTLY DECREASE THE NET ASSET VALUE (IN USD AND OTHER CURRENCIES) OF SUPERFUND GREEN/Blue GOLD. If general trading restrictions of the offering documents make it impossible to fully hedge the assets of Superfund Green/Blue Gold against the gold price, then the gold hedge position will be held as close as possible to the desired full hedge, without blocking assets that are necessary for the generally applied Superfund trading strategy, which will always retain priority within the trading process. NO GUARANTEE CAN BE GIVEN THAT THE TOTAL INVESTMENT PROCEEDS OF SUPERFUND GREEN/BLUE GOLD ARE ALWAYS FULLY HEDGED TO THE CURRENT GOLD PRICE. Since the price of gold may fluctuate substantially over short periods of time, Superfund Green/Blue Gold may be more volatile than other types of investments. A decrease in the USD price of futures and forwards linked to gold, due to these risk factors or other potential factors that may directly affect the price of gold, will have a direct effect on the NAV of Superfund Green/Blue Gold. Special Risk Considerations for Investments in Superfund Red Gold/Silver: In addition to the trading results of the Superfund Red trading strategy, the value of shares of Superfund Red Gold/Silver will be directly affected by movements in the U.S. dollar price of gold or silver. DEPRECIATION OF THE GOLD/SILVER PRICE WILL DIRECTLY DECREASE THE NET ASSET VALUE (IN USD AND OTHER CURRENCIES) OF SUPERFUND RED GOLD/SILVER. If general trading restrictions of the offering documents make it impossible to fully hedge the assets of Superfund Red Gold/Silver against the gold/silver price, then the gold/silver hedge position will be held as close as possible to the desired full hedge, without blocking assets that are necessary for the generally applied Superfund Red trading strategy, which will always retain priority within the trading process. NO GUARANTEE CAN BE GIVEN THAT THE TOTAL INVESTMENT PROCEEDS OF SUPERFUND RED GOLD/SILVER ARE ALWAYS FULLY HEDGED TO THE CURRENT GOLD/SILVER PRICE. Since the price of gold/silver may fluctuate substantially over short periods of time, Superfund Red Gold/Silver may be more volatile than other types of investments. A decrease in the USD price of futures and forwards linked to gold/silver, due to these risk factors or other potential factors that may directly affect the price of gold/silver, will have a direct effect on the NAV of Superfund Red Gold/Silver. DEPRECIATION OF THE GOLD PRICE WILL DIRECTLY DECREASE THE NET ASSET VALUE (IN USD AND OTHER CURRENCIES) OF SUPERFUND RED GOLD. DEPRECIATION OF THE SILVER PRICE WILL DIRECTLY DECREASE THE NET ASSET VALUE (IN USD AND OTHER CURRENCIES) OF SUPERFUND RED SILVER. The simulated performance results for Superfund Red are provided for informational purposes only to indicate historical performance had a comparable Superfund product strategy been available over the relevant period. No representation is being made that any investment in Superfund Red EUR, USD, Gold or Silver will or is likely to achieve results similar to those shown. Past and simulated performance is not indicative of future results. Although the simulation includes adjustments for certain fees payable by the new strategies, the simulated performance results may vary once actual fees are taken into account. Your attention is specifically drawn to the fact that the simulated performance of Superfund Red, Red Gold and Red Silver is based in USD and on the price of gold and silver based in USD and that fluctuations during this time in the USD/EUR exchange rate have not been considered or included in the simulated performance. Hypothetical performance results have many inherent limitations. No representation is being made that any investment will or is likely to achieve profits or losses similar to those shown. In fact, there are frequently sharp differences between hypothetical performance results and the actual results subsequently achieved by any particular fund. There is no single entity or legal body that constitutes the “Superfund Group”. 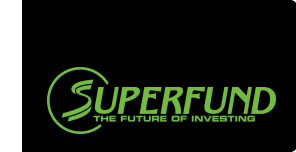 Rather, the Superfund group of investment companies is a consortium of affiliated entities that collectively provide the management, trading advisory, sales and marketing services for the managed futures funds which utilize the same Superfund brand systematic trend-following strategy. Absent valid express written authorization by the company to be bound, no entity within the Superfund group of investment companies shall be liable or incur responsibility for any act or omission of any other entity within the Superfund group of investment companies. SUPERFUND MARKETING & SPORT SPONSORING, INC. CREATED THIS WEBSITE FOR INFORMATIONAL PURPOSES ONLY AND EXPRESSLY DISCLAIMS ANY AND ALL LIABILITY FOR ANY INACCURACIES CONTAINED IN THIS WEBSITE, AND SHALL NOT BE HELD LIABLE FOR THE SAME.